For the 30th year in succession, MEDASSET participated in the Standing Committee Meeting of the Bern Convention at the Council of Europe (Strasbourg, 27-30 November 2018).We presented the results of our sea turtle nesting beach surveys, raised our concerns and submitted recommendations. As a result, the Standing Committee of the Bern Convention adopted important decisions to monitor several sea turtle habitats and urge signatory states to improve protection. Find out more about these campaigns here or download our report. We have been conducting assessments and campaigning to improve the protection of loggerhead nesting beaches in Patara and Fethiye since 1988. Both sites are listed as Specially Protected Areas (SPAs) by the Turkish government. We found that, sadly, the majority of the Recommendations adopted by the Bern Convention in 2015 (No. 182 and No. 183) have not been implemented by the authorities. In Fethiye, the conservation status of the nesting beaches has further deteriorated. For yet another year, we documented several disturbances to sea turtles, nests and hatchlings: more beach furniture, carpets and fixed structures on the nesting zone were not removed at night on most beach sections, litter, sand extraction, planting of trees and bushes on the sand, lack of vehicle access control, severe light pollution, camping and human presence on the nesting beaches at night. In addition to these pressures, damage and reduction of the still remaining nesting zones continued. As a result of poorly-managed coastal development, businesses continues to encroach onto the nesting beach with more fixed structures and expanded into the marine area by installing two new jetties. In Patara, there was no significant improvement and conservation problems remain: no local management staff on site and insufficient nest monitoring personnel, lack of zoning and of information signs along the largest part of the 12 km beach, severe vehicle access problems, camping, etc. There are no signs of new efforts or conservation activities, with the exception of sunbed stacking at night and the removal of derelict toilets and showers from the nesting beach. Behind the beach and inside Patara’s unique archaeological area, the holiday home construction project continues: in addition to the 27 holiday houses that were inhabited in 2015, a total of 255 buildings in different stages of construction are being developed. Through our campaign we are urging authorities to adequately protect the habitat from human disturbances, which are expected to increase many fold due to the much higher number of residents and visitors on the nesting beach. Patara SPA. 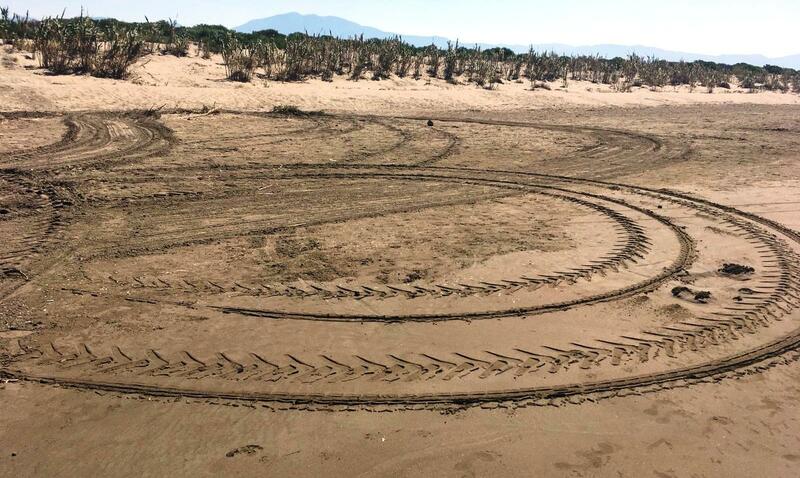 Vehicles drive on the nesting beaches, posing a threat to nests. Find out more about these campaigns here. Download our report and ARCHELON’s report. Nesting beaches in Southern Kyparissia Bay now host the highest number of loggerhead nests in the Mediterranean. Although the beaches belong to an EU NATURA 2000 site, the Greek government has failed to introduce and enforce the necessary conservation and management measures, three years after the Bern Convention Recommendation (Dec. 2014) and two years after the condemning Judgment of the European Court of Justice (Nov. 2016). Although the Greek Government adopted a Presidential Decree in October 2018 affording legal protection to the site, little progress was made to implement the Bern Convention Recommendation. MEDASSET, together with 13 other environmental organisations has reiterated the urgent need for the enforcement of a Management Plan before May 2019, as the Presidential Decree does not address several major issues. At the 2018 Bern Convention Standing Committee meeting, MEDASSET presented in collaboration with ARCHELON the continued degradation of the site and its inadequate management during summer 2018. Threats included sand dune destruction, further planting on the nesting beach and dunes, nearshore fishing, vehicle access on the nesting beach, lack of beach furniture management and light pollution. Photo: Copyright Archelon. 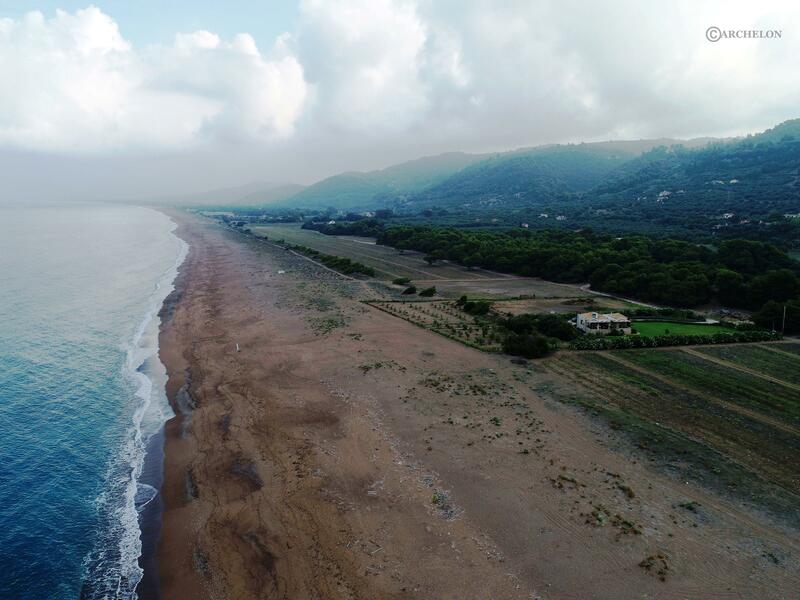 Building, agricultrure and sand dune destruction on nesting beaches in Kyparissia Bay. For more details see Terra Cypria’s 2018 report. Conservation problems at nesting sites in Akamas and adjoining Limni were brought to the attention of the Bern Convention in 1996 by MEDASSET on behalf of NGO “Terra Cypria” and a case file has remained open since 1997, making it one of the longest-standing cases of the Bern Convention. “Terra Cypria” illustrated that implementation of the Convention’s 2016 Recommendation is still outstanding, no legally binding management plans and no effective protection measures are yet in place. Illegal restaurants continue to operate on and next to the nesting beaches in Akamas and a massive golf resort has been approved directly behind the important nesting beach in Limni. “Terra Cypria”, supported by MEDASSET, called for the reinstatement of the originally envisaged 450m buffer zone between the new resort and Limni nesting beach, and urged authorities to take urgent action to ensure enforcement of management measures on all nesting beaches. A review of MEDASSET’s 26-years of sea turtle research & conservation in the Mediterranean: Opportunities for photo-id use.